“The girl winks at you and blows you a kiss as you walk past. You reach out to touch her, but your fingers close on thin air! Is it a ghost? 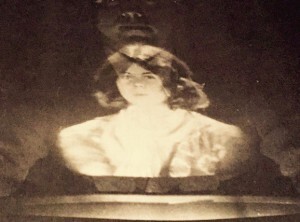 No, that spooky figure is a hologram – a special kind of photograph made with laser light. A holographic image looks exactly like the real person. It’s three-dimensional. You can look at it from above, from below, or from the side. You can even look around behind it. Some holograms appear to move. This is because the film “plays back” a whole series of recorded images which see one after another as you walk past. Electron imaging: By observing the phase shift of electron interference (due to electric and material fields) as they pass through thin film materials, it is possible to determine the composition of materials. Data storage: Conventional optical discs store information on the surface. However, with holography, it is possible to record information throughout the volume of a material and at different angles — hence it’s possible to store orders of magnitude more information that conventional optical data storage techniques. Holographic Optical tweezers: Optical tweezers use forces of light in order to move about small particles (mainly for biological applications) and create optical traps. By using computer generated holograms, researchers can manipulate large arrays of particles over small distances. Security: holograms have been used on bank notes and credit cards for decades. They are typically used because the technology required in order to produce such structures is fairly advanced. In the future, you will see a lot of holographic images. They will leap out of retail store windows to show you the latest fashions and float through haunted houses at amusement parks. They may even help you learn to pitch a baseball or improve your tennis serve right in the comfort of your house and when you’re done with that, how about being part of a movie? Check out this video, which features mixed reality (AR, VR & Holography) to see the art of the possible!